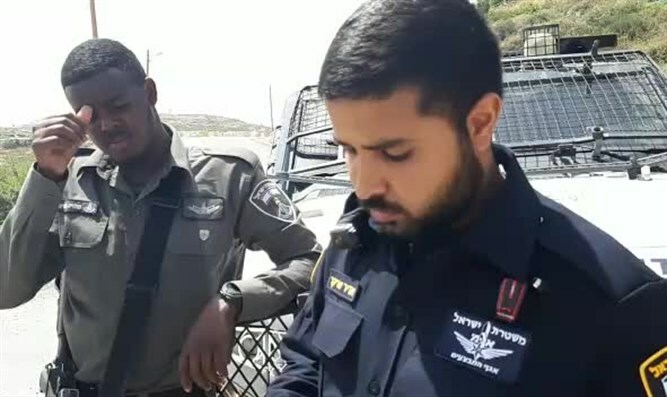 Plainclothes policeman in Yitzhar instructs traffic policeman to confiscate phone for documenting increased enforcement against Jews. Police continue intensified enforcement against Yitzhar residents in Samaria, claiming it to be intended to protect residents' security. However, incidents documented in the last few days raise the question why such resources appear lacking in the struggle against Muslim terror. Otzma Yehudit Movement Director Tzvi Sukkot arrived yesterday to document the traffic policeman stationed at the entrance to the village of Yitzhar, and asked the policeman, "Why specifically Yitzhar?" "Because I feel like doing a roadblock at Yitzhar's front gate," the police officer said. At this point a man in plainclothes claiming to be a police officer arrived in an unmarked car and instructed the policeman to confiscate the phone for photographing police activity. "If this phone has material that needs to be investigated, it has material that can be confiscated, so confiscate it," the officer told the policeman, and continued driving. The Police Spokesman's response has not yet been received. Yesterday police denied reports by Yitzhar residents of intensified operations against them in recent weeks, "enforcement" that made headlines only after MK Bezalel Smotrich (Jewish Home) called the police "nothings" and "brave when bullying settlers". "For example, during the past month, increased traffic enforcement operations were conducted throughout Judea and Samaria, during which more than 1,000 traffic tickets were sent on average per week to all drivers using the road and endangering the road-using public. Additionally during the past few weeks police in Judea and Samaria carried out an operation in which checkpoints were set up to locate and seize vehicles held illegally. "The Israel Police will not be deterred by such baseless criticism, and will continue its important activity in order to maintain rule of law and to enforce the law everywhere and at any time," the police said.